Facebook is very popular to all of us. Are you deleted your Facebook important messages and photos by mistake ? Then don’t be feel sad. Here CodeExercise.com presents a to you Recover Deleted Facebook Messages And Photos trick that we keep your nice smile. So, stay with us to get top best Facebook tricks. Basically its a Latest Facebook trick which you not many people are aware of and hence we will be writing this tutorial to let you guys know about this awesome facebook Trick that Facebook Provides us. The best part of this trick that you no need of having any tool. You can recover your valuable files without any tools. Isn’t it great ? Of course it is. now we are going to show you how to recover such things when you deletd your important messages from Facebook messenger and Facebook app. First of all the important thing is you must log in to your facebook account. After that go to Settings from your browser. Now you are in General Settings. Now you can see a text Download a copy of your Facebook data at the down. Now there there is a Security Step by Facebook. On the Next page you will see a Download Archive Button, Click on it and you will be prompt to enter your Password to Continue. After entering your Facebook Password, Click on Submit. 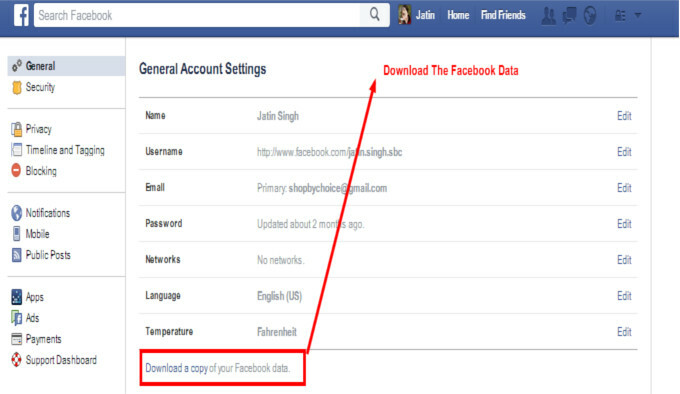 Now wait for Few Minutes cause Facebook will sent you a download link to download your files. Now this is the final step. The file will be in a zip file. Unzip it and open the folder where you will find your photos, messages, Pokes, videos, Friend list etc. Now you have your files on your computer. But the unzip file will be in a HTML format. To get your file double click on the file and select your Favourite Browser to open the file, the File will open up in your browser where you will have access to all your data. Now we think you are happy. Cause you have your lost valuable files to access. Hope you like it. Stay with us to get more.